I’m here today to chat about a new book – Christa Watson‘s Machine Quilting With Style. But a little history is in order. Harriet wrote that as the opening line of her landmark book, Heirloom Machine Quilting, first published in 1987. If you weren’t quilting back then, it’s hard to describe the extent to which it changed how quilters viewed machine-quilted quilts. While it took a little longer for some quilters to come around, without Harriet, we probably wouldn’t be where we are today. 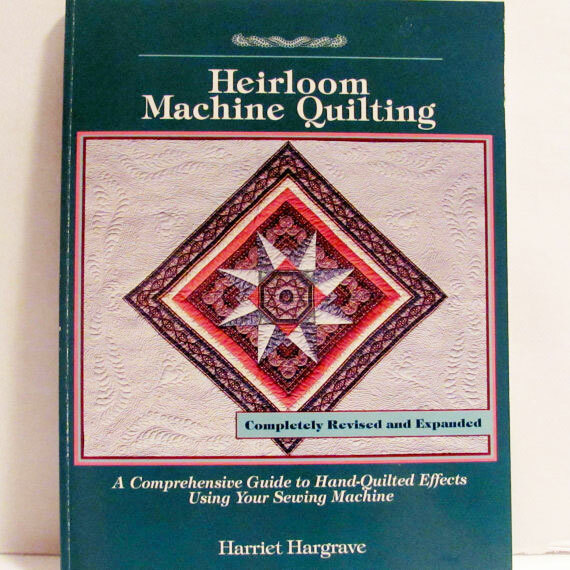 Through all the books I’ve read on the subject in the years since, it’s notable how many acclaimed machine-quilters cite Harriet’s book – or one of its many editions – as their starting point. With bigger quilts, starting a business and the invention of long-arm quilt machines, I wasn’t doing as much quilting. I would occasionally quilt a small project or two… usually just enough to be reminded that this wasn’t exactly like riding a bike, that regular practice was – is – a necessary thing. Flash forward to today. I find myself doing a lot more machine-quilting with my small projects. Most of what I quilt is straight line – sometimes with a wavy stitch. I like straight-line quilting – especially what is often called “organic wavy lines”. I’m not really big on marking lines so I mark my first line – usually with a Hera marker, chalk or masking tape – and then use my presser-foot as a guide. If it’s not perfectly accurate… whatever. So when Christa’s new book came across my desk, I was excited to read it. I was familiar with Christa’s terrific quilts and her machine-quilting from Instagram and her blog, and whenever someone is that good, I know there is plenty to learn. Even if it’s something small – like finding out that we like the same kind of Aurifil 50 wt. thread – it gives me confidence that I’m heading in the right direction. Finishing Touches. This is at the end of the book but I put it here because the middle two sections are the most important – and the most fun. The subjects covered in this last section are piecing quilt backs, layering the “quilt sandwich” and bindings. Walking Foot Wonders. There are seven wonderfully original quilt projects in this section, each quilted with a wonderfully original quilt design that is done with a walking foot. This is Square In A Square and this is the terrific design Christa used for the quilting. Throughout the book, there are boxes with tips – Line Guides, Avoid Quilting On Empty, Triangle Tip Placement and Bobbin Along. The tips are for both piecing and quilting – and they’re placed to be relevant to the project and technique used in that particular quilt project. Free-Motion Favorites. 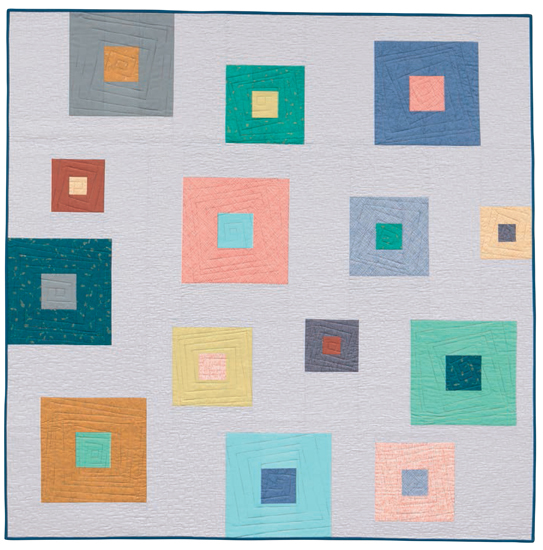 The five quilts in this section build on the skills learned in the first section – or you can jump right into free-motion since Christa’s instructions are so good. There are ten different free-motion quilt motifs presented, starting with basic stippling – which I’ve always found to be much harder than it looks – and moving into waves, pebbles and loops. So do you need this book? Even if you’re a machine-quilting dynamo, I’d bet there is something in this book that you don’t know. It’s got that much terrific information – and twelve really good quilt projects. If you’re like me and you’re looking to pick up a few tips to improve your skills, then yes, I think Christa’s book is a worthy addition to your library. Since this is a blog hop, there are other “stops” to hop to – Christa’s got the complete schedule listed on her blog. A hop without a giveaway isn’t any fun at all so we’ve got you covered there too. If you don’t machine-quilt, that’s okay too. Maybe you’d like to learn. There’s enough to make a big quilt! And after reading Christa’s book, you can quilt it yourself! So go say Hi to Christa – check out the blog schedule, see what you’ve missed and then go have a look-see at her book. And if you’re on Instagram, be sure to say Hi to Christa at @christaquilts and see the projects at #machinequiltingwithstyle. And be sure to vote for which quilt you’d like to see Christa make in January! She’s planning a quilt-along and can’t decide which quilt from the book to make – re-make – so she wants you to decide. You can see each of the quilts on a blog listed on Christa’s blog hop schedule, and then you can vote for your favorite here. The largest quilt I quilted was a twin. I’m working on my machine quilting technique. 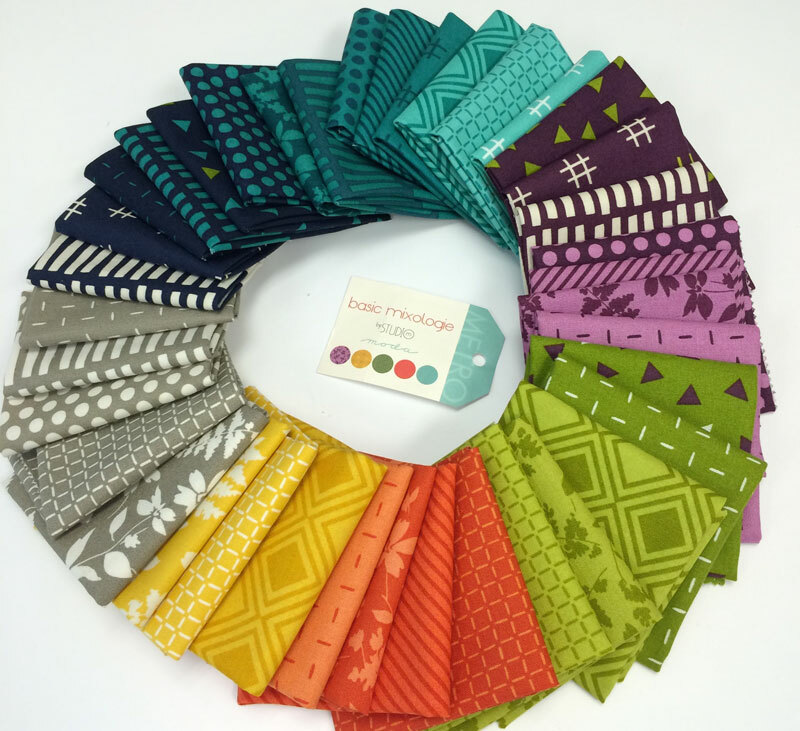 I’d love to get Christa’s book and play with Basic Mixology’s fabrics!! I have done only 2 quilts on my machine. I tried organic wavy lines and love it! The largest quilt I’ve ever quilted was 90 X 90 (Oh my aching arms) on my domestic machine – Free motion loop-de-loops all over! My stitches were not even but I thought, Hey, it adds to the charm, Right? My machine quilting has been limited to only a few small zippered bags! I really need to take the plunge and try something larger…..gulp! This book sounds interesting…..just perhaps straight lines or wavy lines would be manageable. Love the fabric and the chance to win the book! The largest quilt I ever quilted on my domestic sewing machine is a queen size. I really enjoyed all of the process except for the marking. The marking took forever and I went through I-can’t-tell-you-how-many blue marking pens. Next time I quilt something that large I will not be marking it. I’m looking forward to seeing Christa’s book! I love to so simple quilting using my domestic machine. I have not done large quilts but I have done lap and twin bed quilts on my machine. I consider it a challenge to work with my machine because I am unlikely to purchase a long or mid-arm machine at my age. I love to mix hand and machine quilting and embellishment on most of what I quilt. I just love learning and using fabrics as exciting as the one you are including in the hop. Thanks so much for your blog! I never miss them. Hi, I so enjoy this blog, thanks for being so informative on so many topics! I took my first machine quilting class last fall from Peg Spradlin who is one of our local machine quilting experts. She does amazing work. I have only quilted a table runner thus far but have many plans for future projects. I am hoping our library has these books. The basic mixology fabric is phenomenal and I hope I win!!! Thanks again. I think the largest quilt I’ve machine quilted was about 40″ square. I’ve given it away, so I can’t measure! Thanks for the chance to win this great prize. I’ve machine quilted a queen size bed quilt but used the qayg method. Still a major undertaking but I love the results. I machine quilt my smaller projects. I think the biggest was a 48″ square. I’d love to get braver at FMQ and also learn more options for straight line. Thanks! the biggest quilt I machine quilted was 96 x 98 I did it with straight lines which is the only way that I machine quilt. I am mainly a hand quilter but the book sounds interesting – wouldn’t mind winning. My preference is the straight lines – or “organic wavy” I do not like free motion – I like the lines going with the style of the pattern. I have done very little machine quilting. My largest piece was 24×24, and I wasn’t happy with what I did. Maybe someday I’ll get the nerve. The largest quilt I’ve quilted was a full sized quilt with Minky as the backing. Boy, was that a shoulder workout! I think the biggest quilt I’ve machine quilted was 105 by 105. I much prefer to do smaller things like baby quilts and table runners, but I have fun trying new things. The book sounds like it would be really helpful. I’m drooling over that fabric!!! I have only machine quilted small projects but have bought a new machine with the goal of learning machine quilting of larger projects. Such a timely book for me! The biggest quilt I have machine quilted was 92 by 92. I just finished it last month. I was terrified to start it but finally jumped in and tt turned out great. My favorite thing to do is feathers and there were lots of them on this quilt. I’m always looking for tips to improve my machine quilting and Christa’s book sounds one that I should add to my collection. Ok, you’ve hooked me. I’m going to check out the other posts on Christa’s book. The largest quilt I’ve done on my machine was 65″ x 84″. Fortunately, I used the Baptist Fan design, which made is “relatively” easy. For the most part, I stick to smaller couch quilts and baby ones. I haven’t made any large quilts due to the small throat size of my Bernina 350PE. I stick to baby quilt size and love to make bags and purses and quilt those. Carrie, thanks for the recent inspirational zip bags you have posted. I loved the quilt block design on the zip bags and plan on doing that. I did run across a blog recently about doing more machine quilting with a walking foot and did a lap quilt using the orange peel design. It turned out okay but smooshing quilts in my machine is just not fun. So I stick with small projects now. I would love to win the book and am sure I would learn a lot from it…and the fabric would be fabulous to play with. The book sounds like a great reference. I machine quilt lap size and twin size quilts on my very old machine. I am self taught and would sure value some input! The biggest quilt I have machine quilted is 102 by 106 inches. I did use my long arm but still machine quilt on my domestic machine from time to time. Thanks for the chance to win! I just finished machine quilting my first quilt which was lap size. I’m hooked but need to learn more!! I’ve machine quilted a few lap size quilts on my domestic machine. I have done both sit down and long arm quiting. My grandson’s quilt was 66×66. I made the Buggy Barn tractor/truck quilt and quilted around every detail, including the tractor wheels. It took me four full days, but I love the results. I will be on the lookout for this book. It sounds like a great gift for a friend of mine. I’m trying to learn free motion quilting. I have quilted a queen sized quilt – but I did it in three sections that I joined after quilting. That is my go-to method for bigger quilts. My biggest “problem” is that I tend to quilt too densely. I am quilting a twin/throw size “I Spy” quilt. Least favorite part of the process-only do straight line-grid quilting with a walking foot. I’ll have to check out that book; i’m always ready to learn. I use my domestic machine to quilt all my quilts. I used a music notes pantogram to quilt a double size quilt made with ballerina themed fabric for my granddaughter. Thanks for sharing and a chance to win. My largest free motion quilted quilt, in my domestic machine, is about 94 inch square. It went quite smoothly because pattern wasn’t difficult. I should practice more. The largest quilt I’ve quilted was a 65″ square wall hanging. I do quilt small items but leave the large ones to the professionals. I have only quilted baby quilts and they are pathetically bad. I seem to get worse with time instead of better. I do machine quilting, but only with my walking foot. The largest quilt I’ve machine quilted is a baby quilt, about 45 x 45. I am laughing right now because when I started reading your post I thought – it’s never going to happen. I send all my quilts to my sister Andee and she does her magic, machine quilting for me. By the time I finished reading….well maybe I will give it a try on a doll quilt. Thank you for another inspirational posting. I have quilted a twin size quilt but usually I do child size quilts on my domestic machine. I love machine quilting. The largest I’ve done is queen size and it does take some thought when approaching something that large. I quilt only small projects and am rarely happy with the results. This book may be just what I need. Yes I am a Maxine quilter. It is a skill I am learning and practicing all the time and this book looks awesome. I have done machine quilting on several twin size quilts and others not twin but BIG cuddle quilts maybe 60×60. Like everything else practice makes perfect (well better). Thanks for the chance to win a copy! I only machine quilt but am limited to stitching in the ditch and straight lines, so any new idea would be great. Totally intrigued by this post and will ask my LQS to bring it in. I’ve done some basic quilting on my domestic…but find it difficult…a struggle to move the quilt around. I like to complete a quilt on my own so will plan to find a method to deal with the struggle. BTW I really enjoy your posts and do read them all. I’ve quilted so many large quilts that I don’t even remember which was the largest–plenty of bed-sized quilts! I’ve been doing a little FMQ but could really use some great instruction from an expert like Christa. Her book looks great! I can honestly say, that I have machine quilted, but nothing larger than about a placemat size, that is what I have a checkbook for….to pay that wonderful person to put it on that magical big machine and getherdone! I am so intimidated by machine quilting or free motion quilting. I want to do it, so maybe this book will help me overcome my fear. I have only ever attempted little practice squares 12×12. I think the largest was 72 in. square, but have also done several in the 65×75 range. I get better with each quilt I do and my confidence is growing! I recently started machine quilting and love it. The largest project I’ve quilted so far is 32″ x 32″. But, I’m already looking forward to quilting bigger quilts. My largest quilt was 58 x 58! I’m just getting started with machine quilting. I love the freedom to create a pattern that free motion quilting allows. Now that I have the basics down I am doing a lot of reading to improve my accuracy and neatness. Quilting is my new obsession! I only machine quilt. The biggest quilt I’ve ever made is the california king pinwheel quilt I’m making right now. I’ve been working on it since december. The largest quilt I’ve quilted was 88×98 but I rented time at my LQS on their longarm as I knew it would be too much to wrestle with at home. I love Christa’s blog and have been excited to see everything she does. Thanks so much for the opportunity to win the book and those fabulous fat quarters. Love the fabric! The biggest I’ve machine quilted is twin size. I love learning new free motion motifs and gratefully accept all tips. I decided years ago that if I actually wanted to finish a quilt in my lifetime it would be machine quilted! The largest I have quilted was 55×55, but I think I could go a little larger. I used a straight line leafy design. Thanks! I quilt on a domestic machine. The largest has been 70 by 60. My favorite size is 50 by 50. I machine quilted my first quilt, which was a twin size. I did the stitch in the ditch and tried some echo stitching. It was definitely daunting for a beginner and first quilt. I went to making tote bags for a while, but now that I have Christa’s book I am ready to branch out and try more with my walking foot. I do a little machine quilting, but it is mostly straight line, and only on small projects. I do all my own quilting on a domestic machine. I too got my start in machine quilting from Harriet Hargrave’s books. The biggest quilt I’ve done is about 86″ square. I’m working on a top now that will be for my queen size bed. I think it will finish around 96″ (depends on my borders). I quilted a 120X120 King sized bedspread! I didn’t know I couldn’t do it, so I did. I took Harriet Hargrave’s class back in the early 1990’s when she came to Kauai to teach (where I lived). She was amazing and I learned so much! I must have read her book cover to cover five times, and each time something new would sink in. I can’t praise her enough; she is one of the “pioneers” of quilting and I’ll always be grateful that she put her knowledge out there. Heirloom quilting by machine was unheard of at the time! The largest quilt I have ever quilted was a twin size bed quilt. It was a simple all over design. I now have a full size quilt that needs quilting — I’m inspired to do more custom quilting to enhance the piecing and design. Well, I do machine quilt and the biggest quilt I’ve machine quilted was a queen sized quilt. Which I felt was more of a wrestling match with my sewing machine than a machine quilting experience! I swore after that experience that I wouldn’t tackle anything larger than a full sized quilt with my sewing machine, unless I invested in a mid or long arm! My quilting style is straight line quilting, also. The width of the lines may vary sometimes, for example 1/2″ apart and then, 1 inch apart-repeat. The largest project I quilted by machine is a 52″ x 52″ lap throw. The walking foot is useful but not easily installed on my machine. Thanks for the review of Christa’s book and the chance in the giveaway. I did a king size on my longarm by turning it sideways as my frame is only 10.5 feet long. I love free motion quilting and Christa’s book and that fabric would be a winning combination for sure! I just started to really get in to machine quilting and this book sounds wonderful! The largest quilts I have quilted are queen sized. I did make a t-shirt quilt that was larger but never again. I have quilted many quilts on my sewing machine, the largest being about 72″ x 80″, which was all 2″ finished squares that I quilted on both sides of every seam. The texture was terrific! Very recently, I bought a used mid-arm machine that I am doing free motion quilting with. I have quilted about 10 quilts on it so far, but am still in the learning stage. I do machine quilting mostly on smaller projects, but have done a couple of bigger ones, the largest being about 76 x 88. I’d love to check out Christa’s new book! I have not ventured past a lap size quilt for quilting on my home machine. I’m stuck on baby quilts right now, and hope to improve and move on to larger quilts. You give away looks lovely! 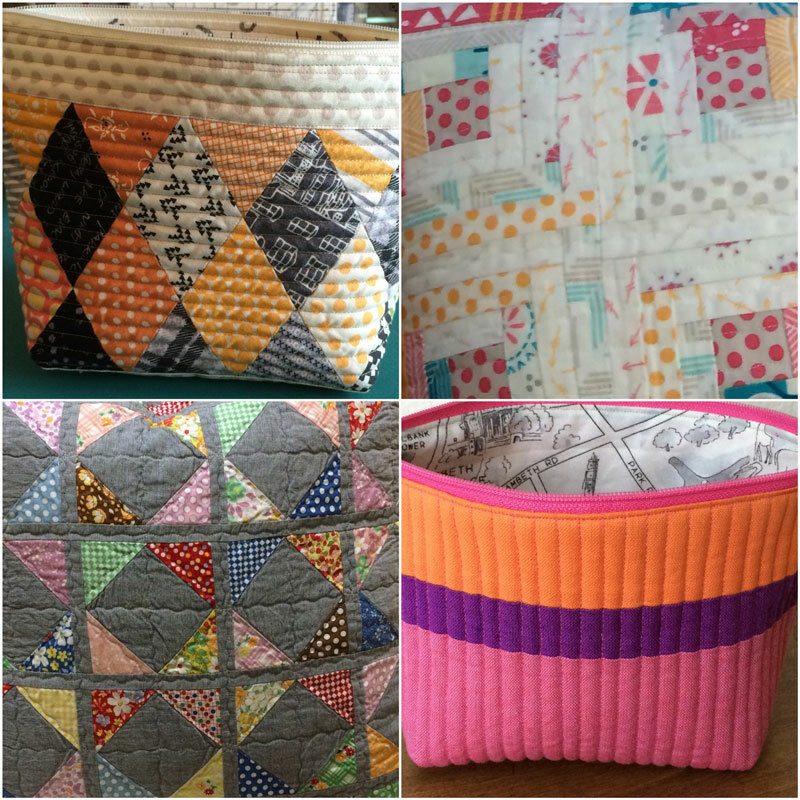 I’ve quilted every baby quilt I’ve ever made on my sewing machine — they’re usually around 50″ square. Nothing fancy as quilting goes, but I always enjoy doing it. Smaller projects are much more fun (and faster!) I think. I machine quilted on my domestic machine for a year and a half and loved it so much I got a longarm last spring. The largest I’ve quilted so far is twin size, but I have two queens lined up just ahead. Looking forward to reading Christa’s book! I am totally new to quilting. I have been trying it out on small zippered bags, but want to try a mini quilt next and work my way up. I am planning to do it all on my machine, so I would love to check out this book. Everything I know is from learning in books and the internet. There have been so many great resources. the biggest quilt I have quilted on my machine at home is a baby quilt. But FMQing I am still practicing. I am not really getting the hang of it too well. I has been over 6 months now and I still look all squiggly. The largest I’ve done is a twin-size, about 62 x 82. Nothing fancy, but it was a challenge since I was fairly new at quilting. Thanks for a great giveaway! I’d love to see the new book and learn some new techniques. Twins are about as large as I like to Machine quilt. The largest I have done is about a 65 x 80, it was on my sit down mid-arm which I’m still learning and getting use to! But I’m loving fmq and learning that I have to practice, practice, practice!. I still do straight line quilting on my sewing machine. I quilted a queen size on my old Kenmore machine. I bar tacked it. I had used a thick thermal batting in it. Since then I have done smaller quilts and wall hangings using a variety of lines and stitch in the ditch. Not much free motion. I’m sure the book would be a great tool to step up variety and and the fabric bundle would be wonderful to make a quilt to experiment on. I just started quilt the first of this year, piecing only and send the one finished to a long arm quilter. Have 3 in the piecing stage and would like to try machine quilting. Also, need stash. I have only done some small projects such as pot holders and tablet cases. I haven’t worked up the nerve to do a quilt yet, but I want to. Have a great day! The biggest project I’ve done is a generous lap quilt (60X70) I’ve only made 3 quilts, still learning. 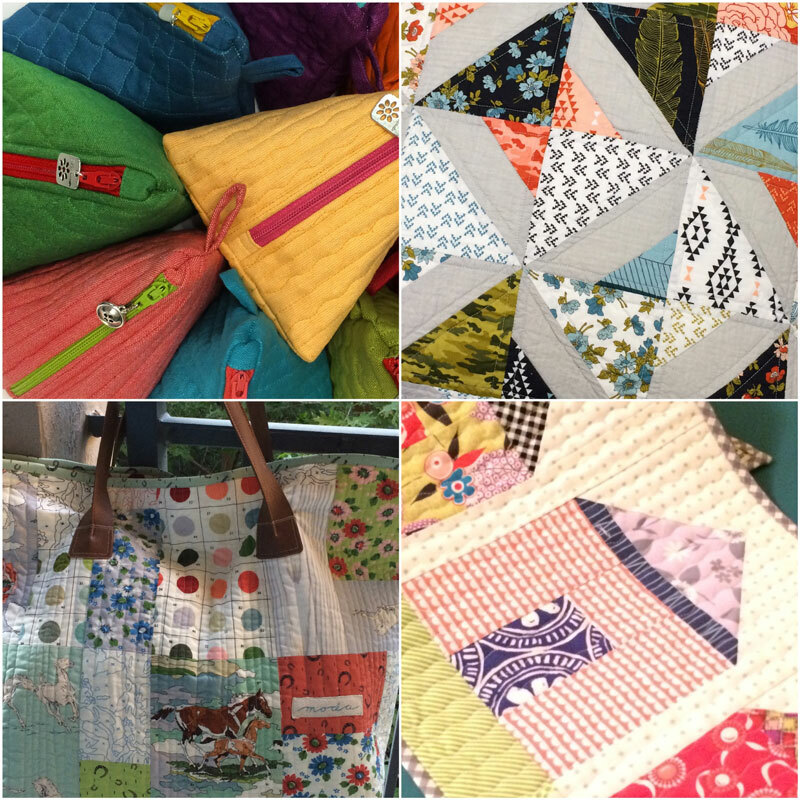 Visit Christa’s blog, her FMQ tips are great! My biggest quilt on home machine was about 50 by 72. Would love to read this book. Most of the quilting I do is on my home sewing machine. The largest I’ve quilted is a queen-size, but it wasn’t fun! I agree that organic straight-line quilting is great! I made a lap sized I-spy quilt for my kiddos….it was kind of tough, but so worth it! This book looks fantastic and a great addition to everyone’s home library. I have quilted a lap quilt on my domestic machine, but am working my way up to a larger one. We will see how that works out. My biggest machine quilted project was a baby quilt that was 45″ x 45″. I was hooked so I bought a long arm. I now use machine quilting for smaller projects like placemats or tablerunners. Love the fabrics. Pattern and material bought I THOUGHT would be lovely winter project for last winter… Until my brother called and said they were getting married in two WEEKS!! Queen sized quilt done and delivered on wedding day!!! 1st machine quilted anything!! Not the most traditional way to start a new type of project… But I got it done! The largest quilt I have done has been a throw, (before I started learning FMQ) and I marked out all of the quilting designs before I made my quilt sandwich. It turned out really pretty, but took me forever. The largest quilt I have quilted is a king size Lone Star. It was done before Harriet’s book. It was a wrestling match. But I got it done. Straight lines only. Don’t even know who for or if it is still around. I’ve learned so much since then. I’m sure this new book will give me some great hints on the next big project in my future. The largest quilt I have done is a queen size quilt. I started quilting on my domestic machine and last year bought a sit down machine with a longer neck. I keep working at machine quilting but it’s always a challenge! I’m sure the book would be helpful, always great to learn something new and the fabric looks beautiful! I do machine quilt many of my quilts, the biggest was 87 x 90 inches, with a combination of walking foot and free motion. For the most part anything bigger than a twin gets sent to a longarmer. Just recently bought a Juki 2010Q and look to be doing some FMQ with it. Need all the inspiration I can get. I have never done a quilt, just small projects like mug rugs. Thanks for the chance to win! The largest quilt I’ve machine quilted so far was a twin. It is was years ago and I didn’t do anything fancy. Now that I’ve gotten back into quilting again, I really want to learn more technique. The largest machine quilt project I’ve done was a queen size. I had some sore shoulders when I was done. I’m looking for some easy (and relaxing) quilt patterns that do not involve lots of marking and me scrunching my shoulders up. 😎 Thanks for the chance to win. I’ve quilted at least 3 king sized quilts on my Bernina sewing machine – one with a walking foot and another 2 with all over free motion stippling. It was a lot of work, and a lot of quilt adjusting to get it all under there! I quilt all but the biggest of my quilts on my domestic machine (currently a Janome 8900). After doing one 62″ x 82″ with a flannel backing, which was so heavy to move around, I stick to smaller or lighter-weight pieces! Recently I began using a ruler-toe foot and rulers, and am enjoying learning this. I would love win Crista”s book and the play with those beautiful fabrics. I have machine quilted my first two quilts with a walking foot. ( they do not look that good to me now). At the time I thought my work was not good enough to pay for a long arm quilter to do. I have been quilting for 4 years and would love to feel confident quilting my larger quilts. My largest quilt on my Bernina 1530 was a 40 x 54 wall hanging using both walking foot and free motion. I just got a HQ Sweet Sixteen, so I’m getting ready to quilt a queen size quilt for my son. I do machine quilt, and the biggest ones I have quilted are three twin size; two for my college sons and one for me,only. I believe the largest quilt I have quilted on my domestic machine was a twin – if I have done any larger quilts it must have been so traumatic I have erased it from my memory! I do like to quilt and have quilted all of my smaller creations. Sorry – this is to finish the comment that got sent accidentally. So it’d be great to win a copy of Christa’s book, I could sure use the help! I have a very small workspace so the biggest I have quilted is a baby quilt. I’m eager to learn more easy straight line designs. I DO machine quilt – the largest quilt I’ve completed on a domestic machine is a queen sized quilt – 90 x 90. Love machine quilting and look forward to getting Christa’s book. I love to free motion quilt because it’s so theraputic and I like my quilts to look organic, not something that came out of china. I love that you can add so much more to your quilt than just the piecing by quilting fun designs in it, like your picture of the quilted wonky squares from Christa’s book. The biggest quilt I FMQed was a KING!!! on my little pfaff with a 7 inch throat !!! I can’t explain how I did it, I must have been crazy or naive when I started it, but I broke the threader which has never been the same even after a visit to the Dr. SO, I bought an HQ sweet sixteen 🙂 I’m a little funny about my quilts being totally made by me. Thanks for the chance to win Christa’s book and all that yummy fabric!!! I Machine quilt. I try to go no larger than throw size on my little machine along as the backing is not minky. I’ve learned the hard way how hard it is to quilt a minky backed quilt. I have only machine quilted small projects – runners, bags, etc., have done a few baby quilts, but hate the basting process, also have very limited space so cannot do a large quilt. I definitely machine quilt! The largest I’ve done on my home machine (Janome 6600) was free motion quilted and was 96″ X 96″. I needed a long rest after that one! The largest quilt I ever quilted is a wall hanging, which I am doing by hand. I can’t get a walking foot or a darning foot for my machine, sew it is hard to have my quilting come out well. I have done some stitch in the ditch or straight line quilting on small pieces like hot pads. I machine quilt and the largest was about 72×72. I’m not great at it but I keep trying! The largest I’ve machine quilted was baby quilts. I’m not sure I want to go bigger than that! I’m thinking about the quilt as you go idea. The largest quilt I’ve ever quilted on my home machine was a flannel quilt that measured 115″ x 115″. While it was challenging it was a huge confidence builder. I was so glad that I had Harriet’s book to guide me. Since then I’ve been collecting books on machine quilting and learn something new with every quilt I do. I like to machine quilt my smaller projects but have done a few bigger quilts. My biggest one so far was about 72 x 80. I’m excited to see what I can learn from this book!! Yes, I machine quilt…..especially for the utilitarian quilts my Mom and I are doing. We are using our quilts and we are loving. My Mom is 86 and still quilts or sews pretty much every day. She is designing more and more and mixology would be a wonderful addition to our design work. We look forward to the book as free motion has not been her favorite. I like free motion quilting, but I’m a wimp when it comes to big quilts. My biggest project so far was a 50 x 50 baby quilt that I stippled really close together. I love the way it turned out, but I can relate to the scrunched shoulder problem! I’ve only done some straight line quilting on baby quilts up to know but I would like to do something a bit more adventurous. I quilt all my own quilts..the largest 72 by 84….but I never, I repeat never drop the dogs! I have tried it many times and need physio or mega doses of muscle relaxers after 5 minutes….I feel myself tightening up just thinking about it. I have given up stitchin in the ditch for the wiggle….love those curvy lines and the freedom from perfection they give me and the totally zen like feeling I get while doing it! The largest quilt I ave quilted is twin sized, but I have started two queen sized quilts that I will need to quilt when I get to that point. I am sure I will need lots of help. I only machine quilt little things. Maybe I will get braver! The biggest quilt I’ve machine quilted is the one I’m just about to start (I layered and pinned it this afternoon!) – it’s 90″ x 102″ and I have no idea how I’m going to squash half of it through my machine but I’ll give it a go! I’m ‘cheating’ slightly as I’m only quilting in the ditch (between all the 6″ blocks) by machine and then I’ll hand quilt the rest: I want to quilt along the diagonal as well as motifs in the snowball blocks and I know there’s no way I’ll manage to stuff the bulk of the quilt through the machine, which I’d need to for the diagonals! Wish me luck…please! I’m quilting a 80 x 80 on my domestic machine right now. I usually quilt throws on my machine. I would love to win her book and beautiful fabric. Have not ever quilted anything larger a twin. The largest quilt I’ve machine quilted was a baby quilt, but I’m almost ready to do a throw quilt, too. I don’t have the measurements as it’s still being pieced…but I’ll estimate it will be around 40×50 or so. Thanks for the chance to win…I love that fabric!!! My third quilt was a queen size that I quilted on my home machine. It was a challenge! I have struggled through machine quilting two twin sized quilts. I followed the roll up the extra material technique which drove me crazy, so I ended up stitching in the ditch only. Finished the quilts by tying or using big stitch hand quilting. I would like to learn the scrunch up the extra fabric method! And the fat quarter give away, ..that abric would make a gorgeous, fun quilt! The largest quilt I have done on my machine is a couch size that ended up about 60 by 60. I mostly do straight line quilting because that is all I know how to do. I too love to quilt with straight lines. I made a queen size quilt for my daughter around 100 inches square which is way too big as she now has a double! I have quilted small quilts such as wall hanging size. I just am not good at smooth curves but can handle straight or wavy lines. That new line of fabric is stunning. Thanks for this opportunity. I love Christa! I have learned so much from following her blog for years! The largest Quilt I have done myself on my machine was lap size. I need to really build my confidence and that means practice! I would love to win your giveaway! Thanks for the chance to win! I’ve always felt that it isn’t really my quilt unless I do the quilting myself. That said, I love to use my walking foot as I feel I have much more control. I’ve not tackled anything larger than a good lap size, but I’m up for the challenge. I’d love to glean from Christa’s book. Thanks for the great post, and the giveaway. And thanks always to Harriet for her foresight that we truly can quilt our own quilts. The largest I have machine quilted is about twin size. I usually do baby quilts,table runners, bags etc. I have a new Bernina so I am enjoying the stitch regulator and the walking foot. My 40 year old Bernina did well on small projects. This book looks like it would give you confidence to go outside your comfort zone. I haven’t ventured beyond straight line quilting on my machine yet but did quilt a large-ish throw size quilt (about 50 x70″), which was a bit difficult to handle. My other projects have been baby quilts and smaller. I’d like to progress to a design that is more than a grid pattern! I do my own machine quilting out of necessity not because I love it. The largest quilt I’ve quilted is a queen size and it seemed to take forever. I need to do a lot of quilting in the near future since I have a stack of tops patiently waiting to be made into something useful. I love Christa’s new book. Love all the patterns and I REALLY love that fabric your giving away. It’s kinda like winning the lottery to get that luscious fabric….as in the lottery winnings…let the dreams begin!!! Hope I win…Let the dreaming commence….. I love to quilt my own quilts on my sewing machine! The biggest one I can remember was 76×76 inches with a heavy batting on a machine with 9 inches of throat. I moved up to one with 11 inches and have hopes of finally making a king-sized quilt for my bed. Around 60X80, but only straight lines or in the ditch. I really need to get braver. I’ve done straight lines with my walking foot, but just baby-sized. Thanks for the chance to win! I quilted a quilt that I made for my brother last October. I think it was about 80 x 80. I typically quilt only baby quilts, minis, and zipper bags, etc. on my machine and I’ve done only straight line quilting, but since the quilt tops are stacking up and my budget is not increasing at a similar rate, I need to start quilting those bigger projects myself! The largest quilt I machine quilted was a large double but my shoulders were in better shape then. At the moment I am quilting a cot quilt and wondering about a machine quilting frame so I can quilt the pile of bed quilts waiting for attention. By necessity–ran out of time–I machine quilted a couch cover. It was long and narrow: 40 x 110″. I just finished it, about two months ago. And then our new rescued dog chewed a hole in it, out of anxiety. It’s a darned good thing I love her more than I love that quilt. But I did cry a bit, after she went to bed. That quilt was soooo heavy…. I have quite a few quilt tops done and waiting to be quilted. This book might get me motivated to begin quilting them! I machine quilt a lot and all on my domestic machine. The largest quilt I have done is a very large queen. Although I’ve done a lot of straight line quilting, meandering, and in the ditch, I’m really working at trying to learn new ways of quilting my quits all on my sewing machine. This book looks great and I can’t wait to get a copy! Anything above a lap size I’ve left to the long armers, but I like making smaller quilts anyway. I am working up the nerve to try more machine quilting. I have done two small baby size quilts so far. One was just a wavy stitch in a large grid pattern. It was fun. Will definitely have to get this book to increase my confidence level. I do some machine quilting on my small quilts, table runners, etc. So far I have done only straight line quilting but I would like to learn some basic free motion techniques – it seems intimidating! The largest I have done is a good size lap quilt. Love these fabrics and Christa’s book looks fabulous. Thanks for the giveaway! I have been machine quilting for19 yrs, mostly straight line or in-the -ditch! The largest I have made is 94×102!!! Very heavy but turned out beautifully! Thank you for the giveaway. Moda rocks my world! I machine quilt, mostly with the walking foot, and the largest I’ve made is a queen sized quilt. Mostly I do smaller projects, or divide the larger ones into sections. Thanks. I machine quilted a table runner–straight lines–and did a pretty decent job (if I do say so myself 🙂 I’d trust Christa completely to hold my hand through something more challenging! Haven’t done any machine quilting for years — but thinking I need to try it again. I did a king size quilt – quel nightmare! If/when I try again – will be sticking to smaller projects! The largest I’ve machine quilted was about 85 x 85 and was like wrestling a big colourful monster. I tamed it in the end but definitely need to improve my machine quilting skills. Thank you for the chance to win such a great giveaway. I love that bundle of Basic Mixology!! I machine quilted- but just straight lines- a floor quilt for a friend’s twins… it was about 44×55 ish and probably a bit much for my first attempt! I also machine quilted- again simply- a quilt slightly larger than crib size. I machine quilt on my domestic machine and the decisions are made organically as I go along. So far the largest was an art quilt about 48″ ‘square’ as it had an irregular shape with ten sides! I did a king size quilt at home and “never again~!” The only way I could have done it was that I had a center carpenter’s wheel medallion, then the whole rest of the quilt was made up of different pieced borders. I was able to roll up the quilt to get at the side of one border at a time, all around the quilt! No surprise — I love doing baby quilts, now! I machine quilt all my own quilts, and have had over fifty. The go to size is a long twin, but I have done a king. I have machine quilted on both my DSM and my LA. My largest quilt has been 108″ x 108″ on my LA. I have done a lot of quilting on my domestic machines, and the largest was probably a twin size. I have probably a dozen or more quilt tops in my closet to quilt and am always looking for inspiration on different ideas for quilting. The only machine quilting I have done so far is straight line and the largest project I have quilted is a table runner and matching pillow covers. Thanks! Yes, I do machine quilt and so far the largest I have done are lap size quilts. I have done a queen size. I’ve quilted 2 90″x90″ quilts on my DSM – a 1974 Kenmore. Plus a few smaller quilts. Most of my quilting is free motion. I enjoy quilting curvy, organic designs that need little or no marking. I have machine quilted small projects like wall hangings and pillows. I, too, want to take the plunge and do my own quilts. I love the freedom of doing designs that will make a quilt outstanding. And the fabrics, they are fabulous colors and designs! Love, love, love, them! I’ve quilted several double size quilts on my home machine, but I have stuck to using straight lines and the waling foot for these big projects. I’d love to use more more free motion and I’m sure Chista can give me advice on that! Thanks for the chance to win! I did make one queen sized quilt – a log cabin design for my mother in law. I do machine quilt, but I am no good at it on bigger quilts. Largest piece I machine quilted was a queen-size (can’t remember the dimensions) but I mad a real hash of it. I’d love to get my mitts on this beauty. A lap size, about 60×60, is the largest I have done. It looks like a great book. The biggest quilt I have quilted on my brother is a baby quilt about 40″x40″. All straight line quilting. I machine quilt, the biggest I’ve done was about 50 by 66 inches. I am currently working on a quilt about 90 x 90 and using mainly my walking foot for straight lines and wavy lines, but forcing myself to try free motion quilting on a few spots. I’ve only machine quilted a couple largish (60X72″ ?) 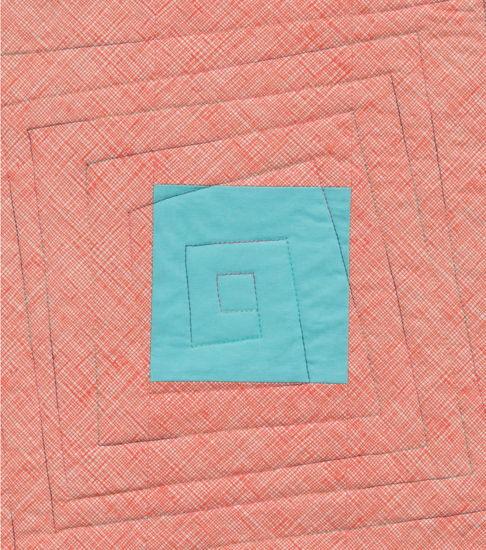 quilts – set the machine to serpentine stitch and quilted over seams. Very easy and fast. Not heavily quilted. Thanks for the chance to win! My biggest project was a queen size bed quilt. Mostly in the ditch – but it took forever! Now it’s just smaller projects. Would love to win this book to provide encouragement to do more! The largest quilt I ever did was a twin size, and I was trying my hand (machine) at meandering. Unfortunately, we had a house fire and I lost everything including that quilt before it was finished. Since then, the largest quilts have been throw sizes. Mixologie is beautiful! I think my mom has the original Harriet Hargrave book. What fun it would be to win. Thank you for the opportunity. I do machine quilt all my smaller quilts, the very large ones go to the favourite long arm quilter friend. The largest I have quilted is my Lone Star quilt which is 70 x 70′ . I do enjoy Christa work. I have learnt a lot following her blog. The biggest thing I’ve done was the first quilt I made: a 60 x 72 blue jean quilt. I had no idea what I was tackling! But I have been sewing all my life, so I did all right. My next project was a 32 x 32 wall hanging. Both were all straight-line machine quilting. I think hand-quilting sounds way too time-consuming, so I’m sticking with the electric needles. Love that phrase! I’ve done a 90 by 90 and never again. Life is too short to wrestle quilts! The book looks great. I normally quilt by checkbook, but need to give it a try. just got a quilting frame with a domestic machine on it………..lots to learn……i’ve quilted a few on my normal machine……….any tips and help will do this book sounds good….. I have quilted a king size quilt, and as I remember it wasn’t fun–I think I’ve blocked the experience. I’d love to learn for small projects, well ok, big ones too when I feel braver. I have used the Flynn frame and things turned out nicely. I use my machine to quilt, I haven’t gotten past meandering stiches though. The biggest quilt I have quilted is a twin size. Thank you for a great giveaway. MY biggest quilt done on my home machine was 96″ X 100. It was a Scrappy Trip round the World” with a fleece backing. I used a serpentine stitch diagonally.. Love simple quilting! The largest quilt I have quilted on my domestic machine is a queen. Now days I send the larger quilts to a long arm quilter and save the smaller projects for myself. The largest quilt I have quilted is a lap quilt. I tend to do smaller projects and only ever use my walking foot! Since I am now a LA quilter I quilt every day, biggest project? Not sure of the measurement but it took ALL of my leader, the backing was actually a couple inches larger than the leaders. Before LA I quilted several queen sized quilts on my domestic machine, hence the Longarm! Reading Harriet’s book was what jump started my machine quilting, still have that book. I quilted an 80″x80 quilt. From now on I’m going to try patterns that lend themselves to a quilt as you go method when I want to make something so big. I putter at machine quilting…..I’ll be good someday! I really want to learn machine quilting! The biggest quilt I have quilted is 54″ by 66″. I am currently working on a 90″ by 90″ quilt but thinking of quilting into 3 sections and then join. My machine’s throat space is only 4.5 inches. Christa is very motivating though. Great write up! At this point, I am usually making bed size quilts and I have those quilted by a long-armer. I quilt smaller projects such as table runners and bags. The book sounds like a winner. Looks like a ‘must have’ book to go onto my wishlist! The biggest quilt I’ve quilted was a monster 90″ square on my Juki! She did a great job! My largest quilt done on a domestic machine was 70×76, a big lap quilt! I took a two day class from Harriet but never practiced like she said we should. I would love to win the fabric and book. Thanks for the giveaway. I machine quilt in straight or curved lines and I’m slowly building up to free motion. The largest I’ve done is a queen sized trip around the world. Love machine quilting… I think the largest I’ve done is a twin bed sized quilt, but bigger are in the works! The largest I have quilted myself was a twin. Felt pretty huge! Thanks for a chance to win. When I started quilting, I wanted to be able to make a quilt from beginning to end. So I learned how to quilt my quilts on my domestic machine. I was able to quilt queen size quilts on my domestic machine, but then I bought a long arm and the largest quilt I’ve quilted myself is king size. I would like to add this book to my library. Thanks for the chance to win a copy of Christa’s book and the beautiful fabric. I have done some machine quilting. I’m most comfortable with somewhat-straight lines (like you) and have practiced with FMQ, but need many more hours of getting the hang of that! The biggest project I’ve machine quilted is a lap quilt for keeping warm on winter evenings. I have never been able to master machine quilting on sewing machine but I think this book will help. I machine quilt all of my quilts. The largest have been queen sized. I have a denim quilt for my son waiting right now that’s 90″x90″. I dread wresting with it but it’ll be done with love. The largest quilt I have machine quilted was about 90″ square. The largest quilt I’ve done so far was a twin for my father in law who’s in a seniors home. Something to make his room a little more homey. I machine quilted a king size quilt on my mother’s old Bernina. It’s 106×106 I think. It was a gift to my daughter’s boyfriend when he graduated from college. It’s a Miss Rosie pattern, Stella Blue but I made it in green and brown since the young man prefers camo everything. The quilt turned out great but it took me a long time to quilt it. I would love to win this book. The biggest quilt that I have done on my domestic machine was twin size, but that will probably change as I have a full size that needs to be quilted before Christmas. Quilted a queen quilt on my home machine once. Never again! The biggest machine quilting project was my very first quilt which was twin-sized. I’ll never do that again. I also love straight line quilting. I’ve quilted a few queen size quilts but nothing too fancy-either straight or wavy lines on this sizes. I hope I can learn to quilt a king size and then say never again. This book would get me started. The fabric is so delicious. This book looks fascinating – I really need some machine quilting tips and confidence. I quilted a twin size flannel quilt using straight lines only and thought that was it – never again. A few years later I started practicing free motion and am using it (not well!) on small projects and baby quilts. I am determined to improve! The largest project I have quilted was a king sized quilt. I regularly quilt queen sized quilts on my little bernina 153. I free motion quilted a throw size “Dwell” quilt on my Singer machine. Each house was different. Mostly have done smaller table runners or baby quilts. My largest on a domestic machine was 80 inches square. Both the top and back were flannel – it weighted a TON. I quilt by machine, sometimes fancier, sometimes just lines. I enjoy it, but I’ll never be a great quilter. The biggest quilt was a twin size for my grandson. I mainly do straight line quilting. The biggest quilt I’ve ever done was Queen sized. I would love to learn more about using my machine to do FMQ. The largest quilt I’ve made and quilted was a king sized for my daughters wedding but I didn’t measure it when it was finished. I did most of it using quilt as you go so not too much wrestling! Would love to win this! I have quilted a few on my domestic machine, the largest being a wall hanging about 40 x 60. I did a lot of FMQ on it to highlight the Amy Butler fabrics. It took me about 20 hours over a long weekend and boy did my shoulders ache after that! I have done a queen on my domestic machine but I must have been crazy to do it. Too much bulk to handle. I’ve done one machine quilt – 68 x 88. It was crazy hard to stuff it all under the machine to get it quilted! Thanks to Jacqui Ghering, I am loving machine quilting with my walking foot. I only began sewing in July, so the one and only thing I’ve quilted myself is a table runner. I’m still getting used to all the fabric with a baby quilt! I’d love the opportunity to make something beautiful with the fabric! Awesome looking book! I have machine quilted a couple of queens! Love using a walking foot on them! I have machine quilted a queen size but love doing machine quilting…it is a combination of saying I did it all myself and being too cheap to pay someone else to do it…is that ok to say that Thanks for the chance to win! I quilt my cotton quilts on my domestic machine and the biggest I have done is 42×60 or so. My largest quilt was 80″ square with a domestic machine. I am currently quilting a bigger than full quilt. It’s really hard! Thanks for the chance. brave enough yet. I have done baby quilts. The largest quilt I’ve FMQed is a double bed size. I use a 16 year old Pfaff. I like to use different patterns. I like to quilt and piece Modern. I do my own machine quilting – when I get a project that far! The biggest quilt is probably a very generous lap quilt – probably an oversize twin size. Oh my, I have Harriet’s book in my library! I had to keep re-reading the whole “your not machine quilting, you are using an electric needle” over and over and over again trying to figure out what kind of electric needle I was missing! I just machine quilted – using a walking foot – a large quilt. 84″ x 111″. Straight line quilting but I first drew an off-sided “X” with tape. Then quilted the “X” and then straight lined the four parts separately. Mit was a pain to get some of that wuilt through my machine which is a standard sewing machine. Quilting lines were just less than an inch apart. I wanted to wash the quilt before putting it in the show but ran out of time.n the reason for the length is I added more of the frontside material to the upper back side of the quilt so when it goes on my bed, the back side can flip up and over the pillows. I would love to win Christa’s book as I follow her blog and like her quilting. I quilt everything I make by machine forvpure economics. The biggest I have done so far is about 90 bt 100. I find FMQ is easier to do with bigger quilts than straight line quilting. I do machine quilt my own work on a Baby Lock Anna (next step up from smallest manual machine). The biggest quilt I’ve done is about 93″ x 98″. Basically a queen for my son, all in cat fabrics. The only thing I marked was about 12 sleeping cat patterns from a template. The rest was either spirals or stippling. Lots of cramming of fabric in the throat for sure. I have quilted several pretty darn big quilts….the biggest was a whopping 92 x 92!! But my trusty old Kenmore has 7″ of harp space….it makes all the difference! I only use straight lines too….I would love to win a copy of this book, or buy it…Thanks for the chance!! Thanks for the post and credit to Harriet Hargrave, she is a trailblazer for us machine quilters. I FMQ on my domestic machine that has a large throat base, to me this makes it poosible to do those queen size quilt. Christa’s books has great things for us to learn. I have machine quilted small items, bags and table runners. I have been Intimidated to try a big project. This book sounds like something I will definitely be buying. Looks like a great book. Imhave quilted a 110″x110″ on my domestic machine — straight-line stitching. I quilted a queen on my domestic machine. I love that quilt it is now my daughters quilt. I love FMQing. I’ve quilted a few crib size quilts but always struggle with the tension. I have quilted a queen size quilt and did it in sections. I was proud of the results but it is a lot of work. It gave me a sense of satisfaction. I prefer doing smaller projects. I will only quilt up to a baby quilt size on my machine. Love the straight line quilting in the pictures! I am currently working on a king sized quilt for my brother on my machine. Very intimidating and I dont think Id do it again any time soon. I can def benefit from some expert advice in this so Id love to win the book and the fabric. Thank you for this lovely giveaway and the chance to win. The biggest I quilt that I machine quilted is a lap quilt. It was difficult but I persisted and finished it! I have quilted a queen sized quilt on my domestic machine, though I quilted it very lightly! There was a lot of quilt wrangling going on!! Yes, I do machine quilting. Some on my domestic machine and some on my mid-arm. And sometimes a little of both on the same quilt! I’ve done large queen quilts but haven’t been brave enough to tackle a king. I have quilted a full size quilt on my domestic machine…not sure how I managed it now that I think back on it. Have done some smaller projects since then and have had some experience on the Longarm but really would like to get more proficient on my home machine. The largest I have done was on a domestic machine and was queen sized.But I divided it into 4 sections and did it QAYG. Still a massive undertaking! I mostly do my own machine quilting, but very simple designs. The largest quilt I’ve done was approximately 70 x 90. Very tiring holding and turning it. But it worked. Would love to learn more about machine quilting. Thanks for the chance! I’ve quilted lap quilts, baby quilts and wall hangings but nothing fancy. Just enough to hold it together through a wash cycle. Ha! Would love to win the book and learn from Christa. Love her creativity. I can handle up to about 60″ wide then it becomes no fun. I am always on the lookout for tips and tricks. I used to do tons of FMQing on my home machine, and loved it. Then I made an oversized queen. I just couldn’t face the pulling and pushing it through my little Bernina. It was several years on the shelf but I bought a longarm and haven’t looked back. I don’t know which quilt I’d like to make with Christa, any could be interesting. Thanks. While I don’t always like Christa’s style or tastes, I follow her blog anyway, because we both quilt on domestic Berninas, and I always learn something or some technique that I can apply to my own quilting. Learning new things and hearing how others do things is important to me! This was a very informative book review and love the possibility of winning a copy. The material bundle; I love those colors and prints. I have been mostly handquilting and am just beginning to quilt on my machine (wish my throat was longer). My first fully machine quilted was a crib quilt so about 36 x 42. I look forward to learning more as I continue to quilt more. HI – I would looove to win this book and fabric bundle !!! I do all my own machine quilting on baby and crib sized quilts but haven’t figured out how to manage anything bigger. I would like to try though – just because I really like the idea of seeing the quilt through all the stages, you know – “completely made by me” itis. Carol from Kansas writes: The more I read about quilting on our machines the more I think I would like to try more quilting. The largest quilt that I have machine quilted is a twin, lap and crib quilts. So far I just meander or squiggle. I machine quilt all the baby quilts that I give to a local NICU through my guild, mostly using my walking foot. I’ve done a bit of FMQ, but don’t really like it, so I send all my larger quilts to a long arm quilter. I’ve wrestled with FMQ for at least 13 years, on a Bernina 170 and more recently a Tiara (sit-down longarm by Babylock – same as the HQ Sweet Sixteen), which I’ve only used 3 times since I bought it in March of 2014. The last time I quilted on it was last October, to finish my entries for my quilt guild’s show. The largest one was 50″ x 70″ – a “1600 Jelly Roll” quilt that I called “Sweet 1600” because I used strips cut from fabrics with candy and ice cream prints as well as tone-on-tones in colors of ice cream flavors and cones. I quilted some sweets – ice cream cones, cupcakes, popsicles, etc., here and there, and many dessert-related words in the tone-on-tone strips (including “time to go to the dentist!”). I would be most happy to win Christa’s book because I know it would inspire me to PRACTICE and finally gain more confidence in FMQ as well as dipping my toes in the modern quilting pool. Thank you and happy quilting to all! Whether I win it or purchase, I need this book! I do all of my own free motion quilting, and while I make mistakes, I get better with each quilt. The largest I’ve done is 73″ x 78.” Became a bit of a challenge at times with my DSM but it doesn’t stop me from trying! I have a Juki 2010Q with a Grace Queen frame and and have done a few pantographs thus far. I also have a Baby Lock Quilter’ s Choice that I have quilted a few baby quilts on, just straight line quilting. I’m working up the courage to do custom FMQ. I straight line quilted a king sized quilt it was 96 x 106. Wowza. It was quite the project. My shoulders were sore forever afterwards. I have not done any quilting before but I would love to learn. At present I mainly do small craft projects and dressmaking. I am enjoying learning about machine quilting and my biggest project so far was an art piece 12″x18″ . I am completely hooked! I typically only do baby or small lap sized quilts on my machine and then do larger quilts on a longarm machine. I’m a beginner and have only tried machine quilting small items like placemats, etc. The biggest quilt I’ve quilted is a twin size. And it’s not done yet! The biggest size for me so far is 60 x 75 but I have one a little larger pinned and ready to go and another king size that I’m trying to decide whether I want to try on my own. There is so much good information out there from great quilters like Christa that it makes taking the plunge into quilting my own things much much easier. The largest was a king -100″ x 120″ on one of my domestic machines. I have quilted many queen size on vintage domestic. I do not use a walking foot. I machine quilted a queen size not long ago, NEVER again, just not fun, and creates a mess on the back. I do love machine quilting on my small size wall hanging though. I’m still trying to quilt it where it looks half way decent. The largest quilt I have finished on my domestic machine was an extra long king (110″ x 120″). It took what seemed to be forever. I tried to do a 90 x 9 on my machine and it was a no go, I ended up hand quilting it. But I am taking a class quilt large projects a small machine. I’m a handquilter of large quilts, and I want to improve my machine quilting on small quilts. I would love to win this book! Thanks for a great review. I will quilt up to lap-sized quilts. All others are quilted by checkbook. However, that does not mean that I do not aspire to quilt beautiful feathers. I machine quilt everything I make, but I have never quilted anything larger than a throw size quilt. I would like to try some designs with my walking foot, I really need to see Christa’s book!! Thanks for the chance to win that and gorgeous fabric!! I am a New Quilter and your book would help me with all aspects of quilting. Largest quilt I’ve finished was 62″x82″. I contemplated free motion quilting for about a minute. Ended up using the walking foot and straight lines. The basic mixologie fabric is gorgeous. I do some machine quilting. The largest one I’ve quilted was a large wall quilt – about 45″ square. I would love to have a longarm, but don’t think it will happen anytime soon. Would love to win this book – I have a lot to learn! I love machine quilting, the biggest quilt I’ve done on my domestic is a twin size. I love to machine quilt on my domestic machine! Usually I do mini quilts, but I took on a twin a few months ago. I did a grid pattern, and it went really well! I quilt on a domestic machine, and the largest I have done is a 100 100 bed quilt. Not sure I would do it again. Thanks for the chance to win. I basically only straight line quilt on my regular machine. I’ve only quilted lap size quilts. I love machine quilting. The largest I have quilted is a king 114 x 114 inches. The biggest thing I’ve quilted was a question sized quilt. Of course that was on my domestic. I now have a mid arm machine and have only quilted small quilts on it. Lovely fabric and can’t wait to check out the book. Thanks for the chance! I’ve machine quilted a few queen sized but many more baby/crib size quilts- still on a huge learning curve and looks by forward to reading Christa’s book! Grr auto correct! That is of course ‘quilted’ not quoted!! The largest quilt I’ve quilted was a queen size on my domestic machine for a family wedding present. Lots and lots of pins. I just kept telling myself, This would take forever to hand quilt and kept muscle-ing on!! I know these hints would certainly help. Thanks for the chance to win! Largest I’ve done is 70″x79″ and I just finished it yesterday! Nothing like fabric and a new book to inspire the next project! I machine quilt and love it! My largest quilts on my domestic are: 105″x83″, 98″x94″ and 96″square. I would love a longarm for those big quilts though! The largest quilt I’ve done on my little machine was slightly less than twin size. I loooove Christa’s work and look forward to her getting her book out of my amazon wish list and into my hands at home! Or winning it would be awesome, too! 😛 Good luck to all who enter! I have one hand quilting project at a time, so others I machine quilt and I’m still learning. I made a 75″ square quilt using organic straight lines for the quilting, and a twin quilt with a loopy meander. Anything bigger I would have to split up then join after quilting…I get carpal tunnel inflammation from time to time and the twin quilt was brutal. My largest quilt was 106 X 100. I quilted it but the quilt as you go method turned out fantastic. Kaffe fasset fabric. I’ve quilted a double size quilt on my domestic. After that I bought a longarm. I’d love to see the Broken Wheel quilt remade. The largest quilt was a queen sized quilt. It took me a while! I haven’t tried machine quilting – yet; I really want to give it a try. I have quilted a few quilts on my DSM, but only with straight lines. I would love to be more creative and try some FMQ. I actually Harriet Hargraves book and have not looked at it in some time. I’ve never managed to get my head around DMQ. Hats off to anyone who’s been able to master it. The largest quilt I have machine, is 56×72. I usually hand quilt my bed quilts. I machine quilt all of my quilts. Some have a little hand quilting details. I think the largest was our king size waterbed quilt. Now that I’ve lowered my machine to be flush with my large extended sewing desk it’s much easier to quilt large pieces. Would love to win Christa’s book and the lovely fabric! The biggest think I’ve quilted was a king single but I am making my swoon and contemplating doing that myself. Brave or foolish? The largest quilt I quilted was twin size for my Mother-in-law’s birthday! I am a beginner quilter I haven’t had the opportunity to machine quilt yet but I am looking forward to it & I will be purchasing my walking foot this coming weekend. I am so excited to try it out. The largest I’ve quited is a twin. I have quilted 2 100×100 quilts on my Juki 2010q. But definitely need lots more practice. My first was a queen denim a year and half ago my second was a queen for the mods home of the brave contest. Then a row by row. Those were my first tops and I also quilted them on my sewing machine. Loving it. I have done a 60 x 80 quilt on my machine, but it was a struggle! I’d love to win Christa’s book, thanks for the giveaway. My biggest was throw size, and that seemed awfully big. I have enjoyed domestic machine quilting, I have done projects as large as 48×60 and have 2 larger ones ready to go next. I like the results of long arm quilters but I like more the scarification of doing it myself. So far Matchstick quilting is the most relaxing for me. I love to FMQ. I’m not that good but I have fun. My largest project is just over 70×80. Thanks! I have and do machine quilt. Always machine quilt my mini’s but I have quilted a couple of large quilts but I am with you, probably not again any time soon. The largest probably 70 by 90 , whew was that a job! I think I need this book. Thanks for the great inside to what is inside! The largest quilt I’ve quilted so far is a full size quilt. It was a challenge, but so worth it! I’m currently working on a 42×54 lap quilt, which is my largest project so far. Just basic straight line for now, but someday I’ll move up to more intricate quilting, like loops…LOL! I have tried straight line quilting but would love to learn other pattern ideas. I’ve quilted all my quilts on my domestic sewing machine, including a couple of king size quilts. One of those was straight line quilting, the other was loop de loops. After all that practice, I’m getting better, but could still learn much more. Christa’s pictures look amazing. I have a confession…I have Harriet’s first book and the revised editions…however I still feel a little overwhelmed when sitting down to my machine to machine quilt. I never feel it will be good enough. I see the need for lots of classes in my future. The largest quilt I have quilted is a single size bed quilt. I would love to be more proficient machine quilting. I have only done small things so far but this book may give me the tips I need. Hi, just learning FMQing now, want to progress from straight walking foot lines! Thanks for sharing!! It was a full size quilt. My largest free motion quilting on a domestic machine was 76″ X 76″. It is the only quilt I keep track of the number of hours which totaled 100 hours. i never kept track again. It did win Best machine quilting, Best of Show and Viewer’s choice awards, so it was worth it. What a great giveaway! The largest quilt I’ve done on my home machine is a large throw. I’ve also done several wall hangings. It is always so much fun when I’m actually doing it, but I forget that in the interim and consequently don’t finish nearly as many projects as I could! Twin size. I mostly stick to 72×72! Trying to talk myself into trying free motion quilting. Christa does wonderful work with her power tool, maybe someday when I grow up. Is it too late to comment? I LOVE CHRISTA’S WORK! Small quilts only. Too many good long arm quilters I need to support. But I would love to improve my quilting skills on my small quilts. I am a brand new quilter and designed a double sided photo quilt for my granddaughter’s graduation, which I had professionally quilted. I am making doll quilts for 5 nieces and just quilted the first one. I don’t have the proper feet yet so the results were less than perfect but great projects to practice on. I am attracted to the artistry of the quilting as much as the piecing so as soon as I have acquired new feet or a new sewing machine I will be practicing different designs on those 4 remaining little quilts! Can’t wait! I have only machine quilted one throw size quilt. I would love to try more.